One of the biggest challenges with online shopping—whether it’s for a pair of jeans or new sneakers—is knowing how something will fit you. And, surprisingly enough, this same pitfall applies to watches, too. As you browse online, here are the key sizing and fit points to keep in mind as you shop for the perfect-fitting watch. Historically, a thin watch case meant a better and more refined complication and garnered a higher price tag as a luxury piece. Today, however, watch tastes have changed with ever-growing case diameters increasing in popularity. In turn, the case thickness has proportionally increased—even if the additional space is not necessarily required to house the watch’s movements. Watch lugs are the metal extensions where the watch case attaches to the bracelet or strap. These lugs are not factored into (and actually stick out further than) the case diameter’s measurements. That said, when measuring your wrist for which size diameter you prefer, leave breathing room for the lugs, which will slightly elongate the height of watch. You do not want a watch where the lugs extend out over your wrist as it is uncomfortable to wear. Most women’s watch straps measure between 6.75-7 inches, men’s typically 7.5-8 inches. Leather, synthetic or non-metal bracelet straps are easy to fit given the pre-made holes. Metal bracelets can be adjusted by a jeweler or watch dealer who can remove or add links for you—just confirm that your purchased watch includes additional links if needed. If not, you can contact the manufacturer to see if they have spare links to send. ​The width of your watch strap or bracelet will depend on the case diameter and lug width–namely, the larger the case diameter, the further apart the lugs, and the wider the band. You are pretty beholden to the band width as it needs to fit the lugs’ spacing. However, you may be able to swap out bracelet the style by, for example, subbing a fabric strap for a leather one of the same width. Large or oversized faces are the “in” look for watches. While some wearers can masterfully pull off a hefty 45mm Panerai Radiomir, the same watch can look disproportionate—even comically oversized—on wearers with small wrists. But why should you miss out on this oversized trend? Wearers with thin wrists are can sport a large watch, too. Just follow these three cardinal rules to find the perfectly-sized-oversized watch for your narrow wrist. ​RULE #1: Watch lugs should never extend beyond the width of your wrist. To ensure your oversized watch looks intentionally large, find a style where the watch lugs do not go over the end of your wrist. Watch lugs are the part of the watch that connect the case to the bracelet. However, watch lugs are not necessarily included in the measurement of the case diameter. So, double-check the length of the lugs as they are the real fit game-changer, even above the case diameter. RULE #2: Watch bracelets should not slide more than an inch up or down your wrist. Regardless of your wrist size, if your watch falls down over your hand or slides up your entire arm, it looks sloppy. And this faux-pas is particularly pronounced if you have a slim wrist. Your watch should fit comfortably around your wrist so that it does not slide more than an inch in either direction. Bring your watch bracelet to a jeweler and have it properly fit to your wrist. RULE #3: Do not overlook case thickness. 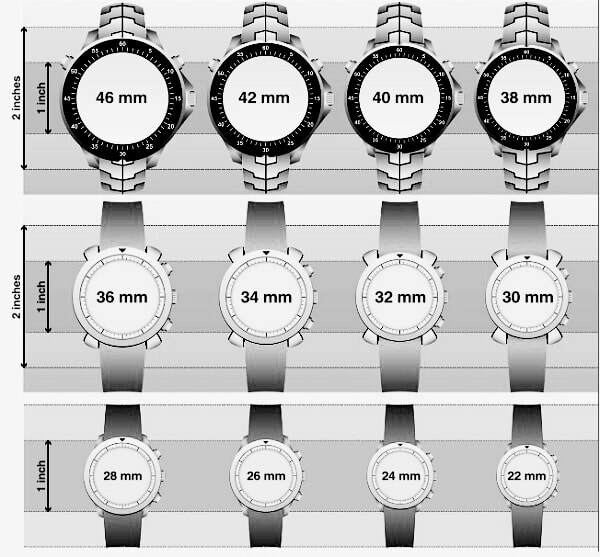 Watch case thickness typically ranges from 6-10mm, with some creeping upwards of 17mm. In turn, the thickness of the watch case affects your perception of a watch’s overall size; thick watches feel bigger. Therefore, slim wrists should opt for a thinner watch case to maintain a good proportion between your wrist and oversized watch.